Today was our first genuinely grim cold weather day. The sun shone for about ten seconds early this morning, then it vanished and didn't come back, and the temperature barely rose above freezing. Clearly the only solution to a day like this is soup. Jalapeño-ginger butternut squash soup, to be exact, because it's rich and spicy and a beautiful yellow color, all things that help me pretend it's not such a gray day. I found this recipe in Sunset Magazine some years ago. It's pretty straightforward. I imagine it works just as well with vegetable stock for a vegetarian version. The only annoying bit is peeling the butternut squash, which is always more difficult than it looks like it should be. It's also wise to avoid getting too grabby with the jalapeño, because "I chopped up a jalapeño and then I touched my _________!" stories are only funny when they happen to somebody else. 1. Heat olive oil in a 4- to 5-qt. pot over high heat. Add garlic, ginger, jalapeño, and salt. Cook 1 to 2 minutes, stirring constantly, until fragrant but not yet browned. Stir in cayenne for 30 seconds. 2. Add squash, broth, brown sugar, and 3 cups water. 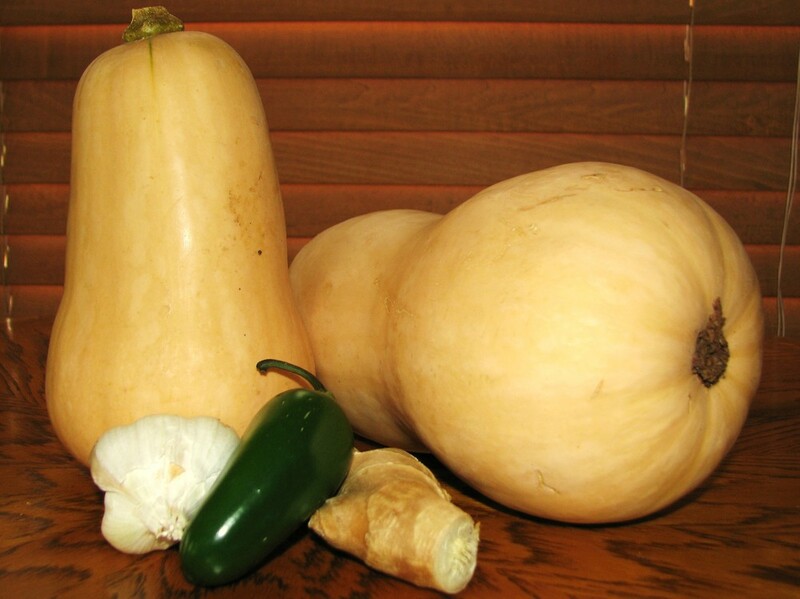 Bring to a boil, lower heat to a simmer, and cook, stirring occasionally, until squash is tender, about 20 minutes. 3. In a blender, purée the soup in batches until smooth, then pour back into the pot. The garlic tends to settle to the bottom while cooking, so make sure to stir the puréed soup well after all the batches are mixed back together. Stir in cream (or milk) and adjust seasonings to taste. 4. Serve hot. The original recipe suggests a swirl of crème fraîche on top, but I prefer to garnish it with a few slices of jalapeño and a sprinkle of cayenne for extra spice. I am also the only person in the house who will eat something with this much flavor and spice, so I end up freezing about 2/3 of it for future gray winter days. We don't actually have very many of those in Colorado, where the sun always shines even when it's so cold your face might freeze off, but it never hurts to be prepared. Newer Post"slightly dazed and more than a little enchanted"